Electric guitarists have always used guitar/amp feedback loops for creative effect. To the trained guitarist, this sound gives the music that ‘close to the limits’ atmosphere, making it feel like everything’s at boiling point and about to go stratospheric. Guitar feedback happens when the sound coming from a guitar’s amplifier causes the pickups and/or strings to vibrate sympathetically. The resulting signal is then returned to the amp, of course, reinforcing the original sound over and over again, until the whole concoction reaches the limits of the amp’s output. Of course, the signal belting out from the speaker cabinet has to reach a certain critical output level in order to push the pickups into sympathetic vibration - at levels under this, not much happens; at levels over it, feedback will start to happen and barrel out of control; but keeping the signal level close to the critical ‘will it, won’t it’ level is a cool trick for a guitarist to pull off. There’s more to guitar/amp feedback than meets the ear, actually. Depending on the note that’s being held, the distance a guitarist is standing from the amp will change how likely the system is to feed back. The distances correspond to the wavelength of the note in question. Moving the guitar to a specific distance from the amp will encourage a certain note to vibrate in sympathy and feed back, while other notes don’t react. Holding the guitar at different lengths to the speaker cabinet was a technique used by guitarist Robert Fripp on obscure artist David Bowie’s little-known and infrequently played song Heroes. Fripp marked places on the floor where certain notes fed back, and moved between them based on the note being played at the time. The rest, as they say, is esoterica. For more feedback-based techniques, pick up the August edition of Computer Music. Step 1: The distorted guitar feedback effect comes from the combination of guitar player and amp in a real space. When the sound coming from the amp is powerful enough to make the pickup coils and/or strings vibrate in sympathy, that sound returns to the amp, then back to the guitar, and so on, in one big feedback loop, until the amp can’t get any louder. Step 2: If you’re using a virtual amp, the only way to create a real feedback loop is to put the guitar next to your monitors, but in this tutorial we’re going to go fully virtual and fake the whole thing. Import a clean guitar track (or use a real guitar) and stick an amp sim of your choosing over it. Step 3: Softube’s Acoustic Feedback plugin has what we need to fake a feedback loop. Add it after the amp sim plugin. Acoustic Feedback sustains the signal in the same style as amp feedback, and can even account for changes and bends in the note. With Acoustic Feedback at its default settings, we immediately get some sustain out of held notes. Step 4: By pushing Acoustic Feedback’s Feedback and Tolerance levels up, we can increase the virtual feedback amounts, making the ‘overload’ respond to subtleties such as vibrato in held notes. We can even get a sort of approximation of the effect at the beginning of Jimi Hendrix’s Foxy Lady. Who’da thunk it? Step 5: And because this is a plugin, we’re far less restricted than in the real world. 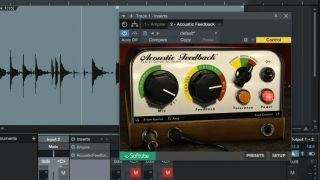 In Acoustic Feedback, we can use the Dry/Wet Mix knob to balance the amount of feedback we hear versus the amount of the original guitar signal. This can lead to some strange and disconcerting sounds. Step 6: Now that we’ve got a feedback simulator, there’s nothing to stop us using it on more than just guitar sources. Try it on all sorts of synth patches to generate a panoply of sounds, from distorted and loud to weird and warbling.